To pay your City of Osseo utility bill, please see the link on the left hand side navigation for more information. To pay a City of Osseo Police citation, please visit the Police Department (415 Central Ave, Osseo MN 55369) or contact Police Department Administrative Assistant Felicia Wallgren by email or by phone at 763.424.5444. Do you wait all year for Osseo’s summer Music and Movies in the Park events? Do you like to catch a ride on the Osseo Trolley and want to help cover the cost of offering this service? 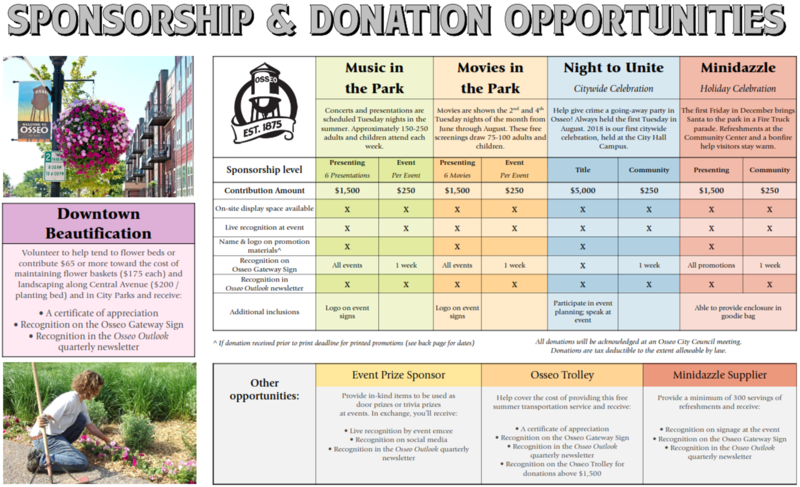 Are you interested in supporting new youth and family programming, or the downtown flower baskets in the City of Osseo? Please consider making a donation to the City’s Community or Beautification Funds. None of these programs would be possible without the generous support of Osseo’s businesses and residents. Special community events and beautiful downtown landscaping in Osseo are made possible by generous donations from businesses, individuals, and volunteers. The City will recognize your contribution in various ways, as described in this brochure. Payments can be made by check and mailed to 415 Central Avenue, Osseo, MN 55369. Faxed and in-person credit card payments are accepted, and cash donations can be made in person at City Hall. For a mailed or faxed donation, you can download a City Donation Form to accompany your donation. Donations will be acknowledged at a City Council meeting and in the quarterly newsletter, the Osseo Outlook, unless otherwise specified. Funds can be offered in Honor or Memory of a loved one. Unless otherwise specified, donations will be placed in the Community Fund and will be used where most needed. Thanks for supporting the City of Osseo!